When digging around for recipe ideas, it occurred to me that I’ve done some very practical dishes lately–meals that make leftovers and are slow cooker friendly and so on. But it’s definitely time to do something fun, purely for the sake of fun. But back up. Before we talk about adding to bacon, which is arguably a perfect food, let’s talk about how to cook bacon into a truly perfect food. By that, I mean the oven. The oven is by far my preferred way to cook bacon. I’m very serious about this. (It is worth noting that I tend to cook regular pork bacon. The oven will work for other kinds of bacon, like turkey; just adjust for the fact that there’s a lot less fat.) I like my bacon on the almost-but-not-quite-burned side of crispy, and the slow heat of the oven is a foolproof way to achieve that. Pan-frying is okay but the bacon just won’t have that perfect crisp to it and there are always those fatty ends that don’t cook through…you know what I mean. In addition to the slow oven heat, there are two other important components. One is foil on the bottom of the pan for easy cleanup, because scraping melted sugar + grease off of a pan is nobody’s idea of a good time. The other is a sturdy baking rack. 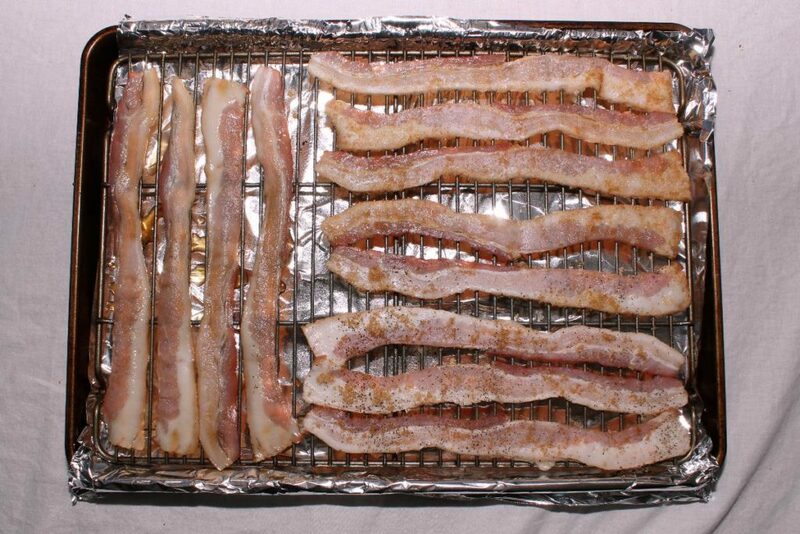 Placing the bacon on a rack means that it’s elevated out of the grease, which means it cooks slower and more evenly, and the improved airflow means increased crispiness. It does mean that you have to clean the rack, but I think the improved taste and texture is worth it. I told you I was serious about this. 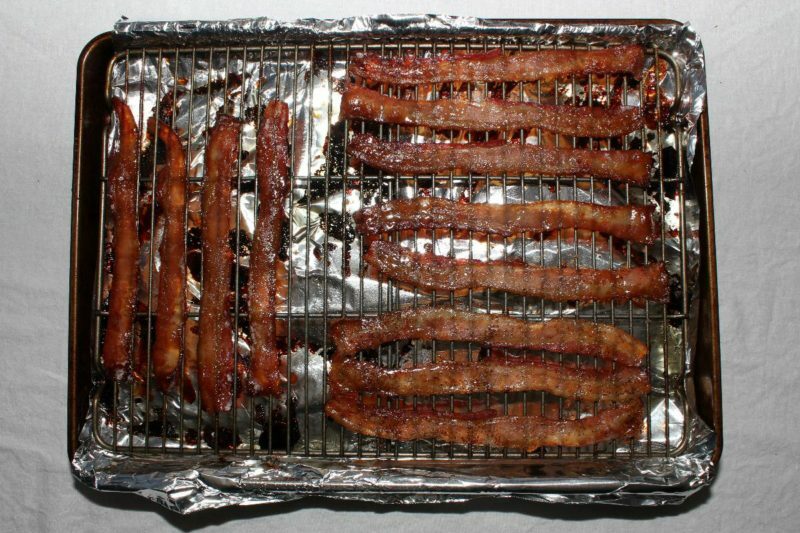 In the recipe below, I’ve listed the three types of candied bacon from least complicated to most, not that any of them are really complicated. If you do plan to do all three, start with the brown sugar & bourbon bacon: it’s the only one that requires pre-oven cook time. Also? I called this “breakfast candy” earlier but let’s be honest. Bacon is an anytime food. The bacon in these photos was eaten for dinner, in fact. 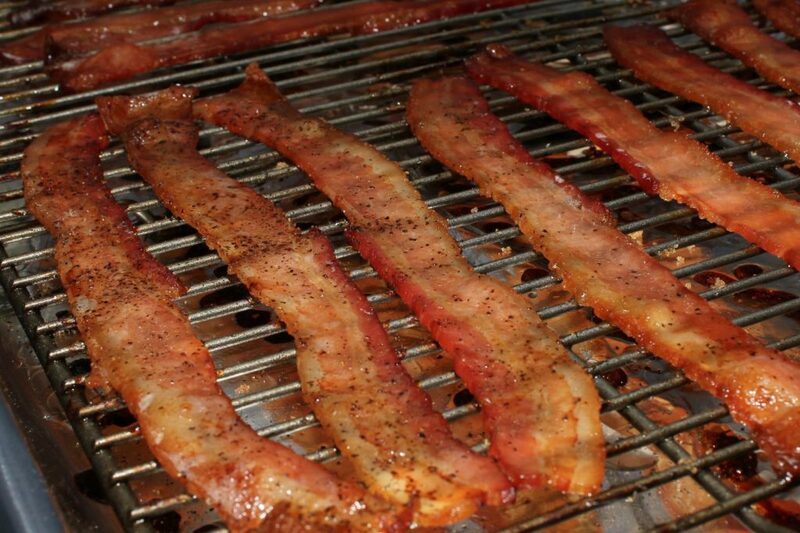 What’s your favorite meal to have bacon? Robby recommends: Intensifying the Brown Sugar Bourbon Bacon with a little pre-planning. Boil the sugar/bourbon mix for only two minutes, just enough to cook off the alcohol. Allow to cool, then pour with bacon into a ziploc bag and allow to marinate for at least 30 minutes. Cook as usual. Go to your happy place. Brown Sugar Bourbon Bacon recipe adapted from The Cookie Rookie. Preheat oven to 350. Cover a cookie sheet with foil. Place a baking rack on top and coat with non-stick spray. Divvy bacon up into 3 equal portions. Put 1/4 cup brown sugar into a bowl. One by one, press bacon strips into sugar, coating on both sides. Place strips on baking rack (not touching, if you can help it). Liberally grind black pepper over both sides of bacon. Coat with sugar, as with Basic Candied Bacon, and lay on rack. Combine 1/4 cup bourbon and 1/4 cup brown sugar in a small pot. Heat over medium high until boiling. Reduce heat and simmer for 10 minutes, until alcohol has burned off and mixture has reduced to a syrup. Use tongs or a fork to dip bacon slices in the bourbon mix. Lay on baking rack. Cook all varieties of bacon for 20-30 minutes, rotating pan once or twice. Check frequently to ensue that sugar doesn't burn. Remove when (or a minute before) your desired level of crispy.